Ramiel: 1d8 times as powerful as any other Angel. "The silver sphere is about twice the size of a billiard ball. It has a couple of very sharp hooks built into it. It flies through the air, attaches itself to your forehead, and digs in. Then a drill comes out and pierces your skull right above the bridge of your nose, while blood spurts out the other end. I hate it when that happens." Large geometric artifacts are unnerving. They are unfamiliar and inhumanly perfect. Visual artists use these common reactions to convey a sense of the unknown and the sinister. While humans could theoretically build perfectly spherical or other large mathematically perfect geometrically objects and devices, it remains a thing we have never actually done historically,note The Pyramids of Egypt come reasonably close, and as per this trope, visitors have found them awesome and mysterious for millennia. Of course, the Egyptians invented geometry. and even with modern technology it still would be a ridiculously difficult undertaking. Even with modern technology such devices seem more than foreign: they seem not of this world. The lack of visual cues is another source of fear. A giant cube in space does not look like a spaceship; it could be anything. It could be a massive bomb, or a toy, or a probe. Consider The Monolithnote Which is a subtrope from 2001: A Space Odyssey: it is the ultimate unknown. This feeds into the reputation for evil that accompanies aliens that have geometric bodies, large or small. There are exceptions. Very large Ringworld style objects are geometric for merely physical reasons. The same is generally true of recognisable space stations and large regular spaces such as hollowed asteroids. Summary: if your aliens are cute as Care Bears, omens be fair. note well, neutral, anyway Picometer perfect polyhedra? Beware. Compare Big Dumb Object, and Alien Geometries. See also Futuristic Pyramid. No relation to Companion Cube... usually. 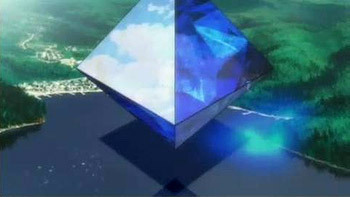 Neon Genesis Evangelion: Ramiel, the fifth Angel, is a translucent octahedron, and its sinister nature is infinitely greater in Rebuild of Evangelion. Leliel is a mobile, circular hole with a spherical "shadow" hovering above it. Leliel is also infinitely thin. And it leads into higher-dimensional space. Or something. Another example would be Armisael, a double helix in a perfect circle. In the Rebuild of Evangelion film remakes, Ramiel can now change into all kinds of new alien shapes and does so in ways that, while renderable on a computer, are virtually impossible in reality, while other Angels are best described as complicated pieces of geometry with off-putting human or animal traits somewhere along the line. Yu-Gi-Oh! and Yu-Gi-Oh! R have two prominent examples, Olympus Mons cards used by main villains. The first is Winged Dragon of Ra, which first appears as a sealed golden sphere when summoned, that will spell the opponent's doom through one of its many effects. The second is the Wicked Avatar, an Evil Knockoff of Ra that appears originally as a giant Pitch-Black sphere, that shapeshifts into the 2nd strongest monster on the field, but packs more power. Digimon Adventure's final Big Bad, Apocalymon, consisted mostly of a giant gold dodecahedron from which claws and a demonic body emerged. In Heroman, the Skrugg are big fans, what with their saucer-shaped mothership, conical landing craft, and gigantic, spherical weapons of mass destruction. For bonus points, as with Ramiel above, Conspicuous CG is liberally applied to emphasise their otherworldliness. Tengen Toppa Gurren Lagann's third arc features enemies that look vaguely like tripods with halos. When destroyed, they break into small, multicoloured spheres, cubes and pyramids (which explode on contact with any solid matter). Bonus points for excellent use of Conspicuous CG: the Mugann are completely computer-animated, unlike most of the rest of the show, which is more traditional. This just serves to emphasize their "alienness". Fist of the North Star has an obelisk holding the power of Hokuto Soukei, the secret weapon needed to defeat Majin Kaioh's Hokuto Ryuuken. It seems to produce a painfully annoying HF sound. In Fate/Zero, Archer's ultimate weapon is a drill-like sword named Ea with the ability to kill targets by twisting and warping physical laws. He summons it by conjuring a strange key made of disjointed rectangular prisms, which opens a gate made of circuitry-like lines of energy. Another character, Kayneth, fights using a familiar that takes the form of a perfect sphere of mercury. The Yggdrasil in Gundam: Reconguista in G is a huge pyramid with a single "eye" that emits strange, branching beams as its weapon. It's shown to be one of the most frightening and dangerous mobile armors in the show, and even when it's destroyed, collateral damage from its explosion kills an important character. The giant black sphere (an egg that contains a monster), cube (a magical prison), and spike (attached to a sea monster) in Fairy Tail: Ice Trail. In the last chapter of Uzumaki, an enormous Spiral City is discovered underneath Kurozu-cho. Especially at this point in the story, such a large structure made from that geometrical pattern just seems deeply unwholesome on some level, even without all the corpses surrounding it. In Slayers, Xellos usually appears in his human disguise, but his true form on the Astral Plane is a large, spinning purple-black cone. In The Authority, the Eldritch Abomination that created the solar system is a pyramid the size of the moon. The spaceship used by Galactus is a similarly massive sphere, though the effect is somewhat mitigated by its Kirby-esque mechanical complexity. According to some versions of Marvel canon, the 2001 Monoliths are tools used by the Celestials. This is because Machine Man first appeared in Jack Kirby's 2001 tie-in comic, and later stories retconned the Monolith in that story to have been a Celestial gizmo. Whether this makes all the Monoliths' other appearances in the 2001 comic part of official Marvel canon (which would mean the Celestials are the never-seen 2001 aliens) is up for fan speculation. Sort of averted in Lucifer in that cherubim take the forms of oscillating golden spheres because spheres are "perfect Platonic solids". They're actually rather pretty. Cherubs that took Lucifer's side have become diminutive ugly humanoids, for some reason. In Amazing Adult Fantasy a giant mysterious sphere appears from a visible orbit around Earth during a time of Cold War-like political tension. Impervious to damage it inspires paranoia in leaders across the globe to point that an eerily confident man claiming responsibility for it can demand anything of them. After fulfilling his request of dismantling their nuclear weaponry, the sphere disassembles, revealing itself to be hollow. The whole scheme was a Paranoia Gambit for world peace. Texas. A wavy landscape which spits out purple blocky spheres. Untraceable. Fractals everywhere with an appropriate background music. In the end of Time Masters, the planet shown by the mysterious aliens known as the Masters of Time is made of two perfect half-spheres and a large glowing cube. The "demonic spheres" of Thirty Hs. The Omnidroid series from The Incredibles. Versions 8 through 10 are both black spheres with retractable Combat Tentacles. In Home, the Gorg mothership and its drones resemble a bunch of giant spiky pyramids stuck together, while the Boov colony ship is basically a giant sphere. The Death Star, the brutal wedge-shaped Star Destroyers, and the hexagonal/spherical TIE fighters are classic examples. As part of the same trope the rebels are more human: the X-wing is closer to a fighter jet, the rebel battleships have curved, organic lines. Kaminoan architecture: circular platforms and hemispherical buildings connected by perfectly linear causeways. The Rubik Snake built by the malevolent AI in Demon Seed. The cylindrical alien probe from Star Trek IV. Borg cubes. However Gene Roddenberry originally intended for the Borg to use spheres, since the Borg were supposed to be the most efficient species and it can be mathematically proven that a sphere is the most efficient shape (in the sense that no other shape with the same surface area will have as great an interior volume). However, spheres were too hard for the special effects people to produce so he was forced to use cubes instead. They do launch a sphere in First Contact. The ships of the Vogon Constructor Fleet from the movie of The Hitchhiker's Guide to the Galaxy were rectilinear. It helped showcase the Vogon's utter lack of imagination. The monolith(s) from 2001: A Space Odyssey: sinister in appearance, and utterly unknown. And exactly 1:4:9 ad infinitum. The Stargate sequence includes the Mindbender shot, depicting seven octahedral shapes made of light which float above an infinite moving plane. THE CUBE (the capitals indicate you speak with reverence while reading it) from Transformers (2007). The Zevo Toy Factory in Toys is made of platonic solids, painted in flat colors. It is filled with them; it is also clearly the home of the protagonists from the beginning. But there's a very definite strangeness to the place, and that's played up for all it's worth in the movie. The 1997 psychological horror film Cube. The protagonists are trapped in a grid of cubic rooms filled with deathtraps. In the sequel Cube 2: Hypercube, the hypercube is the deathtrap. And has this weird tesselation thing at one point that does strange things to reality... as well as dice up one of the characters. The 1969 Jim Henson film The Cube. A protagonist is trapped in a mysterious cube and experiences a series of puzzling and frustrating encounters with people who enter. Especially if you take into account that when the protagonist wounds himself, he bleeds, of all things, strawberry jam, implying that even suicide isn't an option in the Cube. The titular building from AJ Annila's Surreal Horror indie-film Sauna is a small, white rectangular building with a black rectangular doorway. Through creative use of atmosphere it's given an incredibly sinister aura - many reviewers have been reminded of 2001's Monolith, while it also resembles an eyeless face with a gaping mouth. The titular sphere from Sphere. The spaceship used by the Egyptian Pantheon in Enki Bilal's Immortal is naturally a flying pyramid. Hellbound: Hellraiser II, introduces us to Leviathan, the Satan-alike ruler of the Hell dimension. It is portrayed as a giant geometric shape resembling a three-dimensional lozenge that sits at the center of the hell-labyrinth, rotating and emitting a lighthouse beam of pain and evil visions. The alien spacecraft at the end of Starman was a perfectly reflective sphere. Not malevolent, but incomprehensible and spooky. The ominous orbiting tetrahedral space station in Oblivion is creatively called The Tet. It's actually an alien intelligence that cloned and brainwashed the protagonist. And destroyed the world. The Void: The symbol of the cult is a simple black triangle, which also serves as a gateway to an alien dimension. It turns out that this is because there's a Eldritch Abomination on the other side that looks like a giant floating pyramid. Pulp age killer robots were often just a box for a head and body, and sometimes feet. Bars for arms and legs. The Tangle Box uses this as one of the three coinciding plotlines, in which the characters inside are stripped of their memories and magical powers. The titular sphere from Michael Crichton's Sphere. The shining trapezohedron from H. P. Lovecraft's story "The Haunter of the Dark". Gazing into this alien artefact will grant you visions from beyond our world, but also summons the titular monster, an avatar of the Crawling Chaos Nyarlathotep, to kill or possess you. note A trapezonhedron is a prism with kite-shaped sides. A ten-sided die is an example. The Sphere in Flatland probably counts as this, being of perfect geometry even when viewed in 2d space. And the 4-sphere in Flatterland. Indeed, any Flatland or its knockoffs counts. The Phages in Charles Sheffield's Heritage Universe series of novels, found swarming around hundreds of Big Dumb Objects left behind all over the galaxy by a mysterious and long-vanished race known only as the Builders. Phages resemble dull grey dodecahedrons 48 metres to a side and can open a maw on any of their faces to consume anything (or anyone) that gets in their way. It is eventually revealed during the course of the novels that the Phages may be the degenerate remnants of the Builders themselves. The Inhibitors of Revelation Space are a race of Sufficiently Advanced Aliens that manifest as conglomerations of black cubes that operate on unknown principles. They've also been exterminating sentient life for millions of years. The Excession in Iain M. Banks' The Culture novel Excession: a perfect black body sphere impervious to anything, connected to the hyperspace energy grids "above" and "below" the plane of the universe, and enough of an "Outside Context Problem" to freak out even the Deus Est Machina Minds. The Eyes of Stephen Baxter/Arthur C. Clarke's Time Odyssey novels (Time's Eye and Sunstorm) are perfect (and perfectly reflecting) spheres of varying sizes that just hang there without budging. But like the name given to them implies, you feel as though they are watching. Cryptics in The Stormlight Archive have geometric designs for heads. And Words of Radiance shows that they manifest in the Physical Realm as just the pattern, with no body at all. In the book version of The Hitchhiker's Guide to the Galaxy, Vogon ships are described as looking like "large office blocks, which float in the exact way office blocks don't", as well as being covered in ugly hemispherical "boils". Basically, large rectangular prisms with the occasional half sphere sticking out. As mentioned above, the movie wasn't far off from this intent. Pepperpot jokes aside, consider the Daleks' travel machines: cone-shaped, no visible head or normal extremities. Sontaran spaceships are shaped like geodesic spheres, giving the impression that a fleet of menacing EPCOT balls are attacking you. The Void ship in "Army of Ghosts" is not only a scary perfect sphere, it also has no detectable mass or radiation, which instinctively upsets anyone who looks at it. And it's full of Daleks. "The Sound of Drums"/"Last of the Time Lords": The Toclafane are floating spheres armed with disintegrator guns and razor blades. In ABC Family's made-for-TV miniseries version of Fallen, hell includes an endless staircase. The simplest M. C. Escher staircase illusion. Star Trek: Borg cubes and other spaceships. The enormous First Federation ship, which is a sphere made of spheres each larger than the Enterprise. The murderous dividing sphere from Tool's video for their song Parabol/Parabola. Gary Numan is awfully distrustful of the glowing pyramid on the cover of The Pleasure Principle. She Who Lives in Her Name from Exalted is a solid example. Manifested as 100 998 (originally 100 101 - one sphere, surrounded by a hundred, themselves surrounded by a hundred thousand) perfect spheres of fire-containing crystal, she is an utterly brilliant, alien being of unbelievable magical might who despises free will and wants to strip it from everyone. Magic: The Gathering gives us the hedrons of Zendikar. They actually keep the Eldrazi in Zendikar and make it so the Eldrazi can't escape and then eat the plane. The Eldrazi themselves are a case of Alien Geometries. The Monoliths and the general architectures of Necrons from Warhammer 40,000. All stern geometric forms in black and glowing green shades. And they are immortal and implacable omnicidal androids, by the way. One of the more memorable ooze creatures in Dungeons & Dragons is the Gelatinous Cube . A 10 foot cube shaped slime oozing through dark corridors for organic matters to digest. In BIONICLE, Pohatu is bothered by the fact that some of the underground tunnels on Mata Nui are smooth and geometrically perfect, and therefore could not have been dug by Matoran. This was an early piece of foreshadowing on how the the entire island was an artificial construct. The inside of Reapers in Mass Effect are said to be this. They are composed of sharp, geometric and compressed shapes, giving the people who enter them a sense of claustrophobia and paranoia. They act as a type of visual layer on top of the Reapers' already insidious power of indoctrination. They seem to press in on a person, making them feel trapped, disoriented, and powerless, so they more easily lose hope in their willingness to fight the indoctrination. X-COM Enforcer features one, as does XCOM Apocalypse with its eerie dimensional portals that are shaped like pyramids. Also in the franchise, The Bureau: XCOM Declassified has the more unusual alien lifeforms that were held over from earlier passes on the game's design, particularly the Titan. Normally a smooth black pillar, the Titans transform into a strange disk-and-ring formation in order to attack. A recurring enemy in the Final Fantasy series called Mover is just a sphere with some of the most powerful attacks. Ozma returns in Final Fantasy XIV, this time able take the forms of a sphere, cube, and tetrahedron. The structures on the Aparoid homeworld from Star Fox Assault were symmetrical. The Aparoids are bent on assimilation. The entire point of Geometry Wars. While the player-controlled ships are strangely shaped, many of the enemies are perfect circles or regular polygons. until you read supplemental materials and learn that it's perfectly circular to the subatomic level. Games from Halo 4 onward run full-bore with Forerunner weapons and artifacts. Fable II has the Shards, magical war machines, which are just black, metal, floating, upended pyramids that spit lightning. They have strange markings, but are otherwise eerie in their simplicity - especially when they change their forms and mass with casual disregard for physics. The boss of level 10 in Space Harrier II, Bins Been, is an animated icosahedron. Also the original Binzbeans from Space Harrier, prevalent in levels 4, 9, 14 (Ceiciel, Revi and Asute - the ones with the ceilings) and sporadically appearing in 17 (Nark). The hollow, cylindrical Rama, from Rama. The Stone-Like, from Radiant Silvergun. It's a giant octahedron that destroys all life on Earth. And then things get worse. The final boss, Yami in Ōkami has several "big scary sphere" forms. In Myst III: Exile, the Amateria Age is an island consisting of an extensive Giant's Causeway-like basalt column formation... combined with its iridescent mineral springs and glowing crystals it has a very unique otherworldly flavour even for a Myst level. Intelligent Qube pits you against an endless stream of giant, stomping, unstoppable, perfect cubes, and only cubes. The artifact of the white chamber is an imposing black shape, best described as a triangle on a trapezoid. Scarier than it sounds. The Fighting Polygon Team from Super Smash Bros.: They're not regular shapes, but they are polyhedra, and true polyhedra are generally unnatural. Spore. Chances are your exploration across the galaxy will have you stumbling across planets where much of their geography consists of terrain resembling chocolate bars, gears, crystals, or the skin of a pineapple; but nothing is more unsettling than discovering a cube planet, which vaguely resembles a Portal weighted storage cube. The aliens from The Dig, are shown to have a lot of reverence to the five Platonic solids. In fact, the probe that takes the astronauts to their planet looks like a crystal dodecahedron in space. The octahedral Cranassian Power Crystals in the Raiden series, which power the final bosses of most of the games. The Loop 1 Final Boss of IV is an icosadodecahedron. In Shin Megami Tensei III: Nocturne, after the apocalypse, there's suddenly a number of bizarre structures sprouting out of the ground everywhere. They don't seem to be built by human hands at all; there's no furniture in them, they're too smooth and blocky, and have Tron Lines prominently throughout them. In Devil Survivor 2, while the first seven Septentriones are quite unorthodox when it comes to shape, the final Septentrione takes the form of a hypercube encased in a wire frame. The Shivering Isles expansion pack for The Elder Scrolls IV: Oblivion featured a weird, crowded world full of giant multi-coloured mushrooms, bizarre plants, dizzyingly bright skies, strange beings and similar people. Every now and then, you also come across silver obelisks coming up from the ground. They have no markings, make no sound, and cause (as far as you can tell) no harm - but their stark, steely simplicity within the garish realm of madness is both jarring and sinister. They're an effect of the Graymarch, the encroachment of Jyggalag's Order on the Shivering Isles. God of War III featured prominently Pandora's Box, a giant puzzle prison made of cubic rooms interlocking into a shifting giant cubic puzzle. Reassembling this puzzle into a coherent whole is a major plot point of the game. Superbrothers: Sword & Sworcery EP: The Trigon Trifecta, a triplet of upside-down triangles which must be fought and tamed. Almost everything else in the game is done in a retro pixellated style, but the trigons are perfect triangles, which adds to the sense of their otherworldliness. Most of EarthBound's late-game alien enemies are rendered on the overworld as floating grey octahedrons. Unlike most enemies, their actual forms in battles look nothing like these overworld sprites; an octahedron could be anything from an alien bounty hunter to a mysterious robot, and you won't know until you're in battle with it. You run into enemies with the same appearance in the final dungeon of MOTHER 3. However, this time they actually are killer octahedrons, rocks called Minerali. Crystaleyes from Grid Warrior. It's a hexagon with an eye, surrounded by six hexagons (with an eye) that orbit it, each of which are surrounded by six hexagons that orbit them. Gunstar Heroes and its sequels. The four moons and four gems are perfect shapes and holds mysterious powers connected to the big bad. And what's even worse than that? They can think and communicate! By the way, each comes from a different Earth, to which they were sent at first to help mankind and they kind of failed. X-Universe: Where Space Fighters used by the other factions look airplane-like, Khaak fighters are sets of tetrahedrons in various combinations. (Fighter, interceptor, scout. ) Their space stations are clusters of dodecahedrons on sticks, and their capital ships have spider-like arms around a spherical core. Then there's their stationary defense platforms. Most of the residents of the castle are trapped in these in Brave Fencer Musashi. One of the dream worlds in Obsidian is a giant cube-shaped office building, in which you can literally walk on the walls and ceiling, with the camera always remaining upright. Everything there is perfectly straight and geometric, so much that the resident "Vidbots" who run the place with an iron fist fear spheres and circles due to a rebel alliance that knows how to change gravity without following their rules, which you is what you will inevitably do. Pokémon Super Mystery Dungeon has Dark Matter, the abomination that can turn Pokemon into stone, shaped like a sphere in its second form. The Citadel featured in Half-Life 2 is an enormous triangular pillar that dwarfs and overshadows an entire city. The Infinity Sphere in the Leviathans DLC for Stellaris: a jet-black sphere etched with sigils, found in orbit around a black hole. It is one of the eponymous Leviathans, and not to be underestimated. Fallout 3 has the Dunwich Building which in its virulent underchambers stands an obelisk, worshiped by feral ghouls. It was built by Richard Dunwich, the brother of Constance Blackhall, who worshiped Ug-Qualtoth. The last surviving Blackhall wants the Krivbeknih but the Lone Wanderer destroys it, pressing the book against the obelisk and killing those of unclean blood of a firey death. The Gaia Engines of The Secret World. Each one is a gigantic, perfectly-even cube of some mysterious star-studded substance, and for added creepiness points, they are most often encountered in the perpetual night of the Dreaming Prison. It's eventually revealed that they're actually serving as a means of containing the Dreamers, preventing them from awaking from their slumber and keeping their bodies contained... and because of this, they leak Filth when damaged. Throughout the Disgaea series, one of the items that units can equip is a Trapezohedron, which is the highest tier of all the "boost all stats" items. The Epic Battle Fantasy series has the Cosmic Monolith, a black slab of alien rock covered in glowing-red Tron Lines, and is a right Demonic Spider in more ways than one. The main characters (namely Matt in 4, and Anna in 5) see them as The Dreaded, and for good reason. Sinister-looking polyhedrons occasionally pop up in A Beginner's Guide to the End of the Universe, invariably bringing trouble. For example, the Stone Cube sprouts into a Mook Maker tree, while a Stone Tetrahedron transforms into a troublesome Enigmatic Minion. By the time a Stone Dodecahedron pops up, the protagonist has had enough and lasers the heck out of it before it can do something nasty. The "satisfyingly enigmatic'' cone-shaped spaceship from The Inexplicable Adventures of Bob! Schlock Mercenary has the UNS battleplates - gigantic, city-sized warships, usually shaped like a giant triangle or pentagon. Their arrival is usually an Oh, Crap! moment for anyone flying a more reasonably-sized ship. Book 18 introduces the "Carbon-class battleplate," a giant tetrahedron which is both more powerful and more sinister-looking. Considered a Discredited Trope at the SCP Foundation, to the point that one joke SCP includes a granite cube which has been sequestered simply for looking "dangerously Platonic". To be more precise, it is considered a cliche of bad writing because making an object a geometric shape for no reason is lazy. There are a few straight examples of sinister geometry but they all are well written and original enough to not be cliched. The dwarves of Bravemule consider rectangles to be the most wholesome shape. One dwarf architect invents the octagon, which gives other dwarves nightmares because it is such a completely alien shape to them. The Second Renaissance in The Animatrix series features massive octahedral warbots, floating over the shattered battlefield. Bill Cipher from Gravity Falls is a one eyed, triangle shaped Eldritch Abomination and probably the most dangerous creature on the show. In Weirdmagedon, some of Bill Cipher's friends from the Nightmare Realm would fall under this trope as well. Those being Hectorgon, a red hexagon with a mustache and bowler hat, Kryptos, a one eyed diamond shaped creature designed after the Illuminati Compass, and Amorphous Shape, who is a creature made up of many colorful squares. In one episode of Jonny Quest: The Real Adventures, the team visits Easter Island and uncover a circular pod. They are amazed by how perfect its dimensions are. This leads to them finding the information the pod's former owners had on genetic engineering, which causes Surd to hack in, which leads to stuff going very badly for Dr. Quest and Race. Very badly. Shadow Raiders the Beast Planet, a ginormous black sphere that travels across space to devour other planets. In the Star Wars: The Clone Wars episode "Overlords", the planet Mortis appears in realspace as a massive octahedron. Image here. One of the villains from Wander over Yonder is THE BLACK CUBE OF DARKNESS. Its villainy is somewhat hampered by its lack of hands, however, and it later undergoes a HeelFace Turn. The U.S. government commissioned an academic study to recommend architectural designs for nuclear waste storage sites that could be seen as unambiguously dangerous and menacing. The message needed to be universal, so that humans thousands of years in the future would be discouraged from disturbing the radioactive sludge buried there even if language had evolved or if there had been a severe loss of scientific knowledge. Suggested site designs included a grid of huge, closely-spaced black cubes and a field of massive angular metal "thorns" jutting out of the desert floor. Worth noting that the recommendations included that perfect regular structures (which might be regarded as admirable) should be avoided. The actual designs feature jagged lines and irregular geometry. The F-117 Nighthawk and B-2 Spirit stealth bombers. The edgy triangular black Nighthawk covered with triangular facets, and the large black flying-wing B-2 have been often mistaken as UFO's. More modern stealth aircraft, like the F-22 Raptor, are rather less sinister. 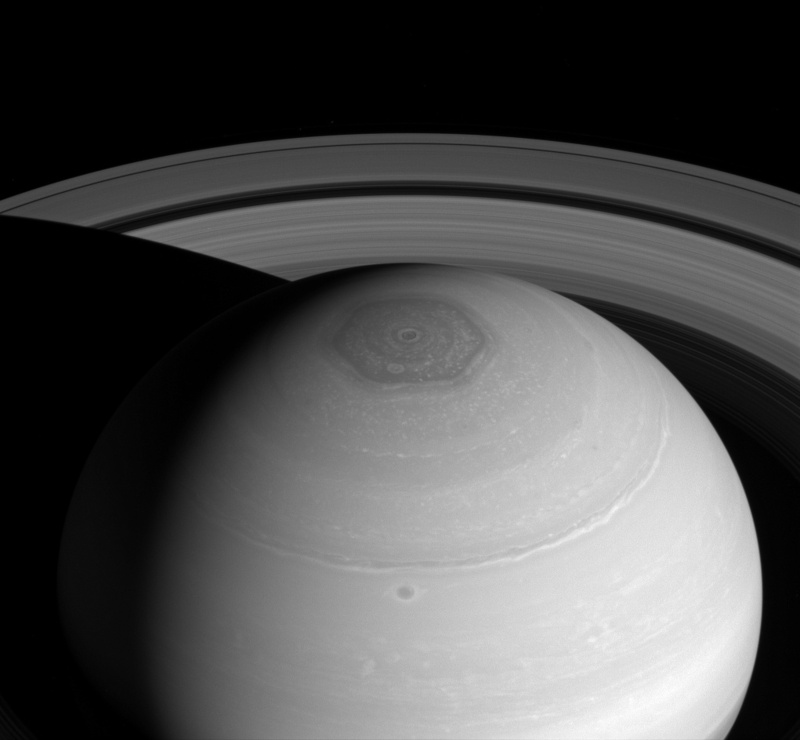 The hexagon of Saturn. ◊ The cloud-bands around the north pole of Saturn form an almost perfect hexagonal shape large enough that the whole Earth would fit into it. Nobody knows for sure how this pattern is formed. The Giant's Causeway off the coast of Ireland, made of many nigh-perfectly formed hexagons, all naturally formed. There are others . While not on the same scale of a plane, the NASA experiment Gravity Probe B uses ~1 inch quartz spheres for gyroscopes that are spherical to within forty atoms. If scaled to the size of the earth, the tallest mountains would be 2.4 m (8 ft) high. Naturally formed crystals can have very unnatural-looking shapes. Minerals such as pyrite and boleite are able to form cubic ◊ crystals ◊.